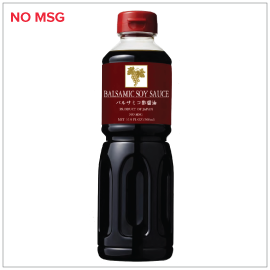 This unique sauce is made with balsamic vinegar from Modena in Italy, and naturally brewed Tokusen special-grade Japanese soy sauce. It has a perfect balance of rich balsamic flavor and deep aroma of soy sauce. Best enjoyed with roasted duck, beef steak or salad. Ingredients: Balsamic vinegar (wine vinegar, concentrated grape juice, sulfites), millet jelly, sugar, water, salt. The premier Japanese food, alcohol beverage and restaurant supply specialist. We are the Japanese food authority - true to the heart in upholding genuine Japanese cuisine traditions and progressive in exploring new ways to provide innovative products and services. Mutual Trading imports, exports, distributes and manufactures the top brands for our retailer and foodservice customers.